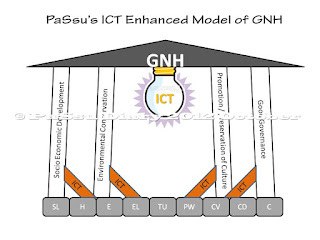 This is how an ICT (Information and Communication Technology) teacher looks at GNH model (see the picture). Imagine socio economic development without banks, or banks without the new technologies. Imagine environment conservation without hitech devices. Imagine preservation of ancient texts and their promotion without computers. Imagine government that doesn't employ computer technology. There is too much to imagine, and we know we can't imagine any of these without technology. But so far we haven't spelled out the role of ICT in achieving GNH, and when something is not specified then it's hard to work on it. ICT needs to be given due importance right now and here. 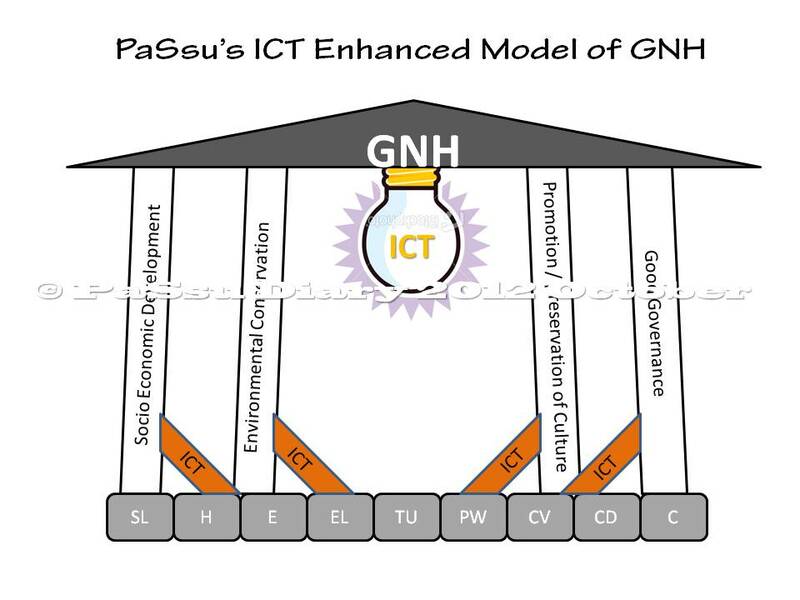 ICT is the supporter to all Four Pillars of GNH and Light to all Nine Domains. put a big Copyright sign on this model...or else people will again claim it as theirs.......LOL. Ha ha ha I have learnt the lesson already. I could see the importance of the ICT in achieving GNH and I liked it very much. I am interested to hear the role of ICT in environmental conservation. I t seems more interesting to me. Your generous explanation will be highly regarded my my curious heart to learn. In conserving Tiger, we need to know where and how tigers live but because they are very elusive we have employed camera-traps to trace them and confirm. I hope this explains who ICT helps in environmental conservation. The scope is endless.